U.S. Secretary of State Mike Pompeo held meetings Wednesday with leaders of Pakistan’s newly elected government, where the two sides agreed to make efforts to reset troubled bilateral relations to jointly push peace in Afghanistan. The relationship between Washington and Islamabad, officially allies in fighting terrorism, has plunged to its lowest point in the past year over allegations Pakistan has covertly enabled the Taliban insurgency to sustain the conflict in the neighboring country. 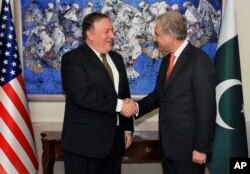 Pompeo, also accompanied by Joint Chiefs of Staff Chairman General Joseph Dunford, held delegation-level talks with Foreign Minister Shah Mehmood Qureshi. The U.S. delegation later held separate meetings with Prime Minister Imran Khan and General Qamar Javed Bajwa, the Pakistan military chief. The top American diplomat sounded cautiously optimistic about the outcome of his meetings. "We talked about their new government, the opportunity to reset the relationship between our two countries across a broad spectrum — economic, business, and commercial,” Pompeo told reporters at the end of his meetings. The discussions, however, appeared to have focused mainly on the crisis in Afghanistan and Pakistan’s “important role” to help end it. “We all know that we need to try and develop a peaceful resolution in Afghanistan, which benefits certainly Afghanistan, but also the United States and Pakistan,” Pompeo said. “And I’m hopeful that the foundation that we laid today will set the conditions for continued success as we start to move forward,” Pompeo told reporters before departing for neighboring India. In this photo released by Press Information Department, visiting U.S. Secretary of State Mike Pompeo, third right, talks with Pakistan's foreign minister Shah Mahmood Qureshi, third left, in Islamabad, Sept. 5, 2018. For his part, Foreign Minister Qureshi said the U.S. delegation brought a "message of willingness to move forward” and described the discussions as cordial and positive. “An atmosphere has emerged after today's meeting to reset our bilateral relations, and the impasse is broken,’” the foreign minister told a news conference late Wednesday. Qureshi said Secretary Pompeo also invited him to the U.S. for furthering the bilateral engagement. Relations between Pakistan and the U.S. suffered a critical blow last year when President Donald Trump unveiled his new strategy to try to break the stalemate in the war with the Afghan Taliban. Trump accused Pakistan of playing a double game, by covertly supporting the insurgency, charges Islamabad rejected as an attempt to coverup for U.S. military failures in ending the Afghan conflict. The tensions have led to suspension of all U.S. military assistance to Pakistan since the start of the year, bringing mutual engagements to “almost non-existent” until Wednesday. Pakistan consistently denies it is providing havens for the insurgents. It has also been pressing Washington to find a negotiated end to the conflict. The government in Islamabad says the use of military force has failed to achieve the objective and instead encouraged terrorism in the region, allowing the Taliban to capture more Afghan territory in the process. Qureshi said that in Wednesday’s interactions with Pompeo and his team, the U.S. side conveyed its readiness to engage with the Taliban to promote a political solution to the Afghan war. In this photo released by Pakistan's Press Information Department, visiting U.S. Secretary of State Mike Pompeo, left, shakes hand with Pakistan's Foreign Minister Shah Mahmood Qureshi, prior to their meeting in Islamabad, Pakistan, Sept. 5, 2018. "That's where you see America and Pakistan have a convergence of views, and I think we can move forward on this,” he noted. Just days before Pompeo visited Pakistan, the Pentagon announced it had decided to scrap $300 million in military aid to Pakistan, citing the country’s lack of cooperation with Trump’s South Asia strategy. Islamabad swiftly dismissed the assertions, saying the money was not U.S. aid but reimbursements for expenses incurred by Pakistan using its own resources to fight regional terrorism in support of Washington’s counterterrorism efforts. The United States has now withheld $800 million from its so-called Coalition Support Funds since the start of the year. A U.S. military training program for Pakistani officers also has been terminated and civilian financial assistance to Islamabad has dropped to “zero,” according to officials. Despite persistent diplomatic tensions, analysts rule out a total breakdown of U.S.-Pakistan ties. They note that Washington's military mission in landlocked Afghanistan heavily depends on ground and air lines of communications through Pakistan for ferrying key supplies to about 23,000 U.S. and NATO forces deployed in the neighboring country for training and advising Afghan forces battling the Taliban. While speaking to reporters Wednesday, General Dunford dismissed concerns that Pakistan intended to block the supply lines because of suspension in mutual engagements. He said the U.S. military-to-military cooperation with the South Asian ally has remained in place despite diplomatic tensions. “We don’t have any reason to indicate that our cooperation in keeping the GLOCs [ground lines of communications] open is going to change,” Dunford replied when asked whether the Pakistani side raised the issue during the dialogue. Afghan and U.S. officials have pressed Islamabad to use force against leaders and fighters of the Taliban allegedly sheltering in Pakistan to push them to engage in peace talks with the Kabul government. Pakistani officials maintain the insurgents have gone back to the other side of the border in the wake of counterterrorism operations. Islamabad says it is ready to make all possible efforts and use its “limited” influence on the Taliban to encourage an Afghan peace dialogue. The Pakistan military has ruled out the possibility of launching operations against “residual” Taliban insurgents it suspects are sheltering among nearly 3 million Afghan refugees Pakistan still hosts.